Arguably my favorite rebel rock icon Chuck D has been working with L.A’s SceneFour Art and releasing amazing premium prints since 2011. The Prints are signed 40″ x 30″ limited editions on canvas. They’re political, smart and look amazing. The first one ‘By The Time I Got To Arizona’ spotlighted Arizona’s immigration contention. The latest one calls out America’s continual embarrassment, Florida. 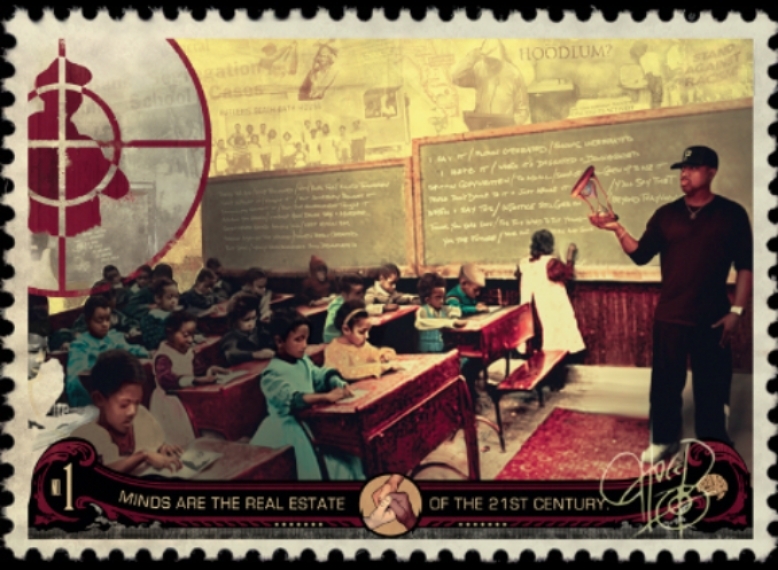 Framed as a postage stamp it depicts Chuck teaching a class of Florida youth. Some of the cerebral points are the back wall telling florida’s sordid past and the hourglass representing rolling back time. One of my heroes appears on this stamp.